This ain’t your dad’s SG-1000 game. The year is 1986. Peter Gabriel’s “So” is conquering the airwaves with its blend of pop-funk and world music. “Top Gun” is teaching audiences everywhere that bromance is a thing. And I am one-year-old, unable to speak, but extremely capable of pooping my pants. Meanwhile in Japan, Sega quietly releases the last SG-1000 cartridge ever, The Castle. 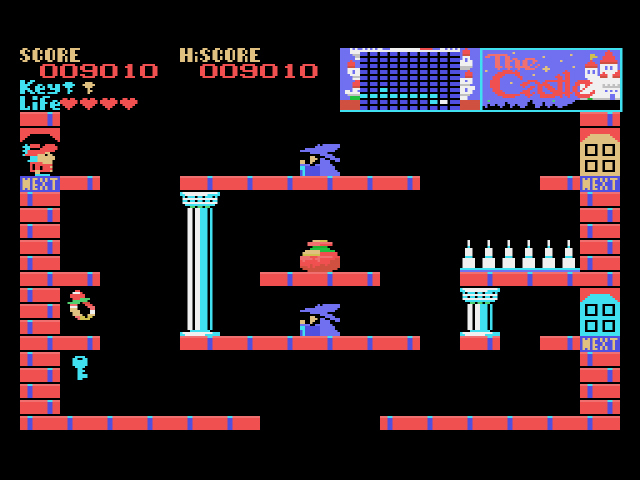 As is common with games released towards the end of a system’s lifespan, The Castle does not resemble an SG-1000 game at all. Yeah, the game’s slow like other SG-1000 games (by design, sure, but still slow), and it has that same limited color palette that all SG-1000 titles have, but its large size and non-linear structure point towards the future of gaming rather than Sega’s simplistic arcade-based past. In The Castle, you play as a prince who must rescue a princess from The Castle’s dark, cavernous walls. There are one hundred rooms to explore within the Castle and you must explore all of them. Within the rooms are keys of various colors, little trinkets that give you bonus points, and various enemies, like knights, wizards, and other castle-oriented folk. The keys are the most important thing to collect because each room has at least one locked door. Often you will have to backtrack if you don’t have the right key for the right door, but thankfully, The Castle gives you a map fairly early on. The map doesn’t tell you the locations of any keys, but it does highlight your progress and let you know where you’ve been. The map is telling me that I have many rooms left to explore. The prince of The Castle is weak, in terms of attack power. If he so much as touches an enemy, he’ll die. He does, however, have an amazing jump where he levitates in the air for a couple seconds, a la’ Bomb Jack or Princess Toadstool from Super Mario Bros. 2. The prince’s jump is your key to navigating throughout the game. But you might notice that the prince – heck, every character in the game – moves like geriatrics. This is intentional on the developers’ part. The entire game is paced slowly to allow you to grow accustomed to the power of the prince’s jump and the movement patterns of the different enemies. This deliberate lack-of-speed sounds strange in concept, but it works really well in practice. And whenever you want to speed the game up (like when you’re stuck on a lift), press Button 1 to make the game move faster. If The Castle sounds at all familiar, that’s because it’s the prequel to Castlequest, the oft-derided NES game where you explore a castle, collect multi-colored keys to unlock multi-colored locked doors, and all-around get lost and feel helpless. I hated Castlequest when I first reviewed it some three years ago. The game has a looser feel that makes it difficult to discern where to go and what to do. The Castle isn’t necessarily simpler, but it does feel more streamlined and focused. In Castlequest, you don’t need to explore every room, thus you can waste keys by entering certain rooms. In The Castle, however, every room serves a purpose, even if it’s just to give you more keys. Look at all those keys. Truly, I am a rich man. The Castle isn’t the deepest adventure compared to other 1986 non-linear outings like Metroid and Legend of Zelda, but it’s still a fantastic game. I couldn’t stop collecting keys. So many keys! So many colors! I had to get them all, even if it meant several untimely deaths at the edge of a spike or between a moving platform and a wall or by grazing a knight as I slowly leapt over him. Amassing large quantities of keys while exploring the one-hundred rooms of the castle satisfied the obsessive-compulsive collector/explorer within my soul. The SG-1000, God bless it, probably doesn’t deserve a game this fulfilling, but Sega – proud parents that they were, I suppose – felt led to give it one anyway. The Castle is both an excellent game in its own right, and a powerful testament to what Sega could do with incredible limitations. All Sega fans should give it a shot. Previous Article So, How ‘Bout Them Sega Games! I’d play an SG-1000 version of Castlequest, if only to give it another shot. I was looking around at some Sega forums last night, and the consensus is that The Castle is good, Castlequest bad.